The MrBean Hussain & Chris Read Letters: Boys will be..? When Mubeen Hussain emerged from the womb and a midwife smacked his arse he screamed “racist” followed by loud sobs of “me, me, me”. Many thought the midwife had smacked the wrong end, and should have a second or even third go. Muhbeen followed uncle Mahroof into the family business of doing….not a lot really. Through a strange mix of caste, biraderi and really pushy mums the Hussain men have decided they are chosen by God to be leaders of men. For his birthday the family gave him a small political party…Rotherham Muslim Youth. It wouldn’t fit his ego, so taking it back to M&S he changed it for a bigger one…British Muslim Youth. Muhbeen got his first big break in the Rotherhama CSE gig, when hordes of journalists beat a path to the town. The turning point coming while being interviewed for the BBC , outside the Town Hall by his Cousin. Two white youths in a car shouted out asking the way to Jacko’s Takeaway and Carwash. In the cold, the wind, the rain and with emotions running hot, their strong local accents translated into “eff off you effing b***k bast***d”. The journalist cousin also had a head cold. A martyr was born and since then he’s had numerous victories. He was particularly adept at using his media cousins to spot disillusioned BBC researchers from Stockport, press-ganged into visiting Rotherham to find the authentic voice of Muslim Youth. “Ye Gods, its freezing in this dump. Whose the nerd over there with the please interview me placard?” Said one such. Most stunning was his effort to organise a boycott of the Police because of their deeply offensive success in capturing the perpetrators of two nasty hate crimes. Apparently great aunt Taiba had to step in and remind him, you boycott the Police when they fail, for which there are many opportunities, but this is not one of them. Now he’s had a set back. He’s attempted to grab self publicity by demanding a meeting with the Council Leader, Chris Read, claiming he (not Read) is a misunderstood youth deserving of some love and attention. Cllr Read’s response was in essence, “go away you obnoxious little twerp.” Read, having appointed two, out of three, Kashmiri Cllr’s to his first cabinet of just 4 people reckons he knows a self serving little twerp when he sees one. Muhbeen further chose to illustrate his dumbness by publishing the correspondence, thereby revealing his impotence on Twitter. I reckon aunt Cllr Taiba and great uncle Cllr Saghir should find him something useful to do after he’s broken the toy the family gave him….otherwise family izzat is in for a hit among those who matter. 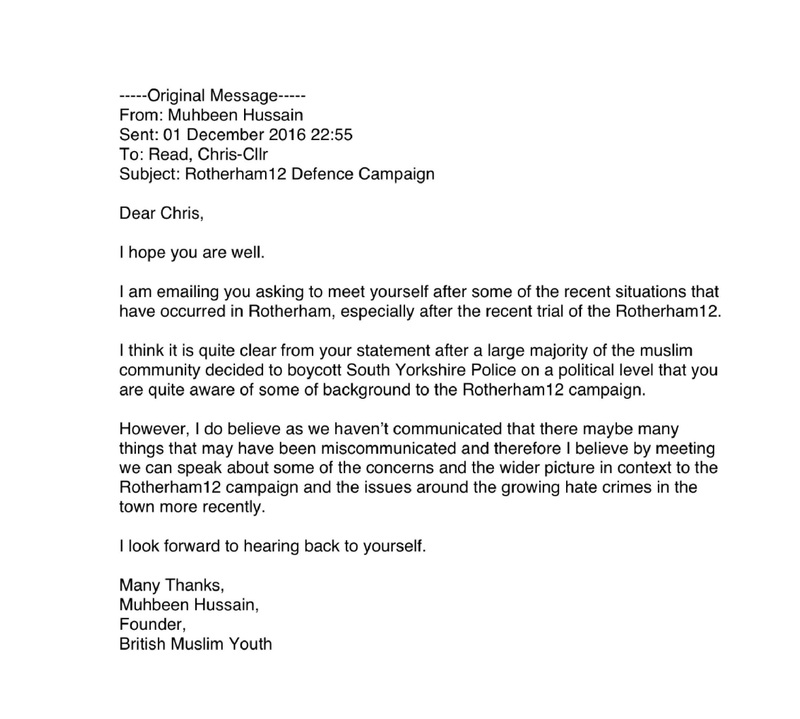 .Chris Read is referring to this boycott: Rotherham Muslim group refuses to co-operate with South Yorkshire Police and threatens to abandon any Muslim that does. This entry was posted in Abuse of power, Biraderi, Uncategorized and tagged Azad Kashmir, Biraderi, Biraderism, BMY, Boycott of Police, British Muslim Youth, Chris Read, Kashmir, Kashmiri youth, Mahroof Hussain, Misogynist, Misogyny, Muhbeen Hussain, RMBC, Rotherham Metropolitan Borough Council, South Yorkshire Police, Vakas Hussain by Rik. Bookmark the permalink. Self Important. Deflated. Ego. Publicity Seeking. Not. Very. Bright. Pretty good “putdown” response from Read – I wonder who wrote it for him ?? Whether Read wrote it or not, and the style certainly suggests he might well have done, an excellent response and a very very good put down. Does anybody know what Muhbeen Hussain actually does, other than hang around pretending to be the voice of Muslim Youth….work, business etc? Or what he has achieved other than being there when 12 of his mates got arrested, thereby peeing off their mums and dads? This is a serious question…all serious answers appreciated, and “funny but clean” ones liked. Just read Muhbeen response, Read has really upset him. Laughable him claiming that the council should’ve held the Police to account, would’ve needed to if his so called leaders of the Muslim community had stop this abuse of children. Noticed these Muslim always play the victims, never admit fault. My guess is that someone complained that the organisation does not fulfil the conditions for an org.uk site. (A WhoIs on Nominet indicates that The British Muslim Youth site is registered to a private individual – name withheld.) Silly boys! I’d have tweeted this but mocking his name is not acceptable. As Mr Read has said quite clearly: “it isn’t a personal vanity project” so maybe Wil would enable me to tweet this article if he were to remove the childish and unacceptable digs? Go to town over policy, views and opinions and nothing else. Paddy, you’re a pretentious prig who clearly fails to try and understand the role of humour and satire in the history of British political writing….even stuff as humble and ordinary as my own. All of the information I spend my time researching and converting into these somewhat impoverished prose is out there for you find and write about yourself..so why don’t you try and do that instead of kidding yourself you’re fighting the revolution in Twitter pieces limited to a hundred or so charectors. I am quite humble in my expectations, yet you may think me perverse in saying I couldn’t give toss about whether or not you retweet me. Thanks for clearing that up Wil. You make me laugh, apart from that, your article was informative and hit a chord with me but I can’t put it out there as a piece of research done by you as you’re mocking the guys name. I assume you wrote it for people to read? A lot less people will read it as a result of you mocking that guy, and certainly now cause your response is arrogant and abusive. “Its not a personal vanity project” and “go to town over policy” appear to be the phrases you need to examine very, very carefully. I have no time nor desire to write about this stuff…it was depressing in 2003 just as much as it is in 2017. The only difference is I was on the frontline crying foul about CSE in 2003…and you weren’t. Honestly Paddy…no you weren’t on the front line fighting CSE. There are too many people reading this blog who know you were so far up the arse of Jahangir Akhtar as to in effect denyi CSE and the role of Kashmiri taxi drivers, and I’m sure Rik will have examples of you apologias for him…paddy, you are sadly as irrelevant as me, but much more pretentious and self deluding. I remember one day one day bumping into a fuming Mahroof, fuming at an email from yourself wherein you described him as a terrible Councillor and suggesting he should take a leaf out of the book of the magnificent Jahangir Akhtar. Or have you forgotten those days? You are a legend in your own sad living room. muhbeen wants to write a letter to c read about all the pakistani landlords which have made areas like wellgate and eastwood worthless. in this case one point to the leader . I think Read responded well to a person who is only interested in helping himself through the vial of race relations. Now, I’m not in anyway fan of Muhbeen and his BMY organisation primarily as I’m slightly uncomfortable with the people he has around in his circle, people who’ve no experience in volunteering or community work yet jump on the bandwagon so they can make themselves look good in the eyes of their community. The police ban was poorly thought out and executed and his, Mahroof and their family’s self-importance to Rotherham is a tad nauseating. Personally, I thought Read’s initial response did deliver with a few “ouch!” moments for Muhbeen but I still expect a leader of the council to show more poise when replying to an email of that nature which was fairly innocuous. A Mr Jahangir Ahmed is named as the BBC Look North reporter in one of the comments. Firstly a small apology to Paddy C, I disagree with his comments on my article, I disagree with him..but he is entitled to an opinion and it deserves respect. However I think Muhbeen and brother Vakas don’t really deserve respect, and their pomposity bubble needs to be pricked. Hence the humour. A little research further evidences their BMY to be nothing but a vehicle for Muhbeen’s self promotion. BMY is registered as a Community Interest Company (CIC), with only 3 member Directors..Muhbeen, Vakas and a pal/cousin. While any capital sums/equipment has to be protected for community use, Directors can be paid either direct or via contracts…unlike simple Charitable Registered organisations where Directors are unpaid, save for basic, provable and recorded expenses. There are no limits on Directors remuneration in a CIC. Indeed there are only fairly limited financial reporting requirements made of CIC. There are no other members, and looking at their web site there is no apparent membership scheme. Meetings do not seem to be advertised, indeed they only seem to occur when Muhbeen wants a bit of PR. How they gather the opinions of Muslim Youth, outside their family and pals is to put it mildly “opaque”. 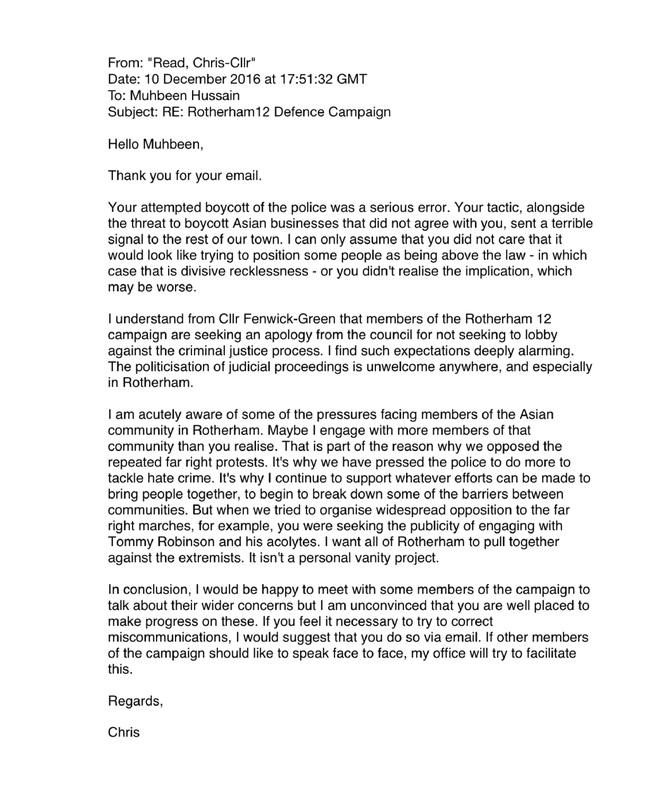 The BMY doesn’t appear to be in partnership or be aligned with any of the other Rotherham Muslim groups. On their web site I saw photographs of demos and events positioned in a way to suggest BMY organised them…on at least one occasion I know they didn’t, but merely piggy backed of the work of others. I would also like to know if anyone has seen one of their cleanup teams, since the initial launch and publicity? I choose to laugh at Muhbeen and Vakas, but don’t kid myself that they couldn’t be dangerous, primarily by discrediting the Muslim Youth they pretend to represent. How old are these people? Surely youth ends at 21 years of age. Muhbeen looks about 30 to me and if it’s a Britain-wide movement where are the members from other parts of the country? According to his LinkedIn profile, Vakas graduated in 2012, which would make him probably 26/28 at most. Muhbeen is, I understand, quite a bit younger. As I understand it that is one of the many points that Wil has been making. There most probably aren’t any. It was probably the model for Muhbeen’s CIC. Convicted, violent thug Akhtar could also have been described as such but owing to Labour’s cowardly refusal to face him down he finished up as deputy leader of the council and vice chairman of the SY Police and Crime Panel. Both he and the Hussains should be given very short shrift. He should change the name now to …. British muslim men …..obviously no women because to muslim men they are not able to debate and think for themselves …I think I read some where that muslim men believe women are worth half a man ….what a disgusting belief in the 21st century ….this is not the 1400s. Thanks for your small apology Wil, I’m pleased the other person, yourself and I now agree on the issue of mocking the guys name. A lot of things are being raised on this thread which go right to the heart of policy, for example, what does BMY do? Who are they? Who is on the membership list? Etc etc. Thats where the battle ground is. Understand this foolish and perhaps worse individual, is on the airwaves today. On ITV he seems to be a fixture?